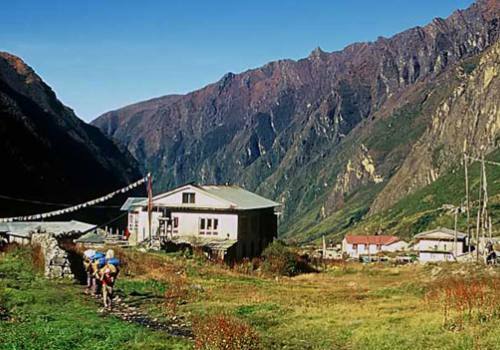 An adventurous and challenging Langtang Ganjala Pass Trekking ascends from 1470m, Syabrubesi, a day drive from Kathmandu then the trail follows Classic Langtang Valley Trek, until reaching Kyanjin Gompa through Lama Hotel, Ghoda Tabela, culturally and traditionally rich Lantang Village. This trek is less trekked trail of the region because of its difficulty, requires some basic mountaineering knowledge and climbing equipment but offers an opportunity to explore Tibetan style Tamang Villages, high alpine pasture, spectacular close-up views of surrounding peaks and glaciers of Langtang Lirung (7246m), Kimshung (6781m), Langshisha Ri (6370m) with breath stopping views of Ganesh Himal, Dorje Lakpa, Yala peak, Naya kanga, Gaurishanker etc. 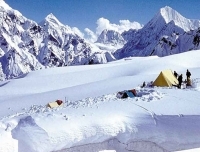 is an entirely wilderness adventure experience and thrilling trekking for body and mind experience. After an exciting explore or acclimatization day in Kyanjin Gompa we trek about 3-4 hours to Ngegang crossing Lantang Khola which is a last good place to camp then set up for awesome Ganjala Pass. There are some yak and goat herder’s places and during the rainy season the carry bamboo mat to provide roof for huts. The trek from Ngegang to Keldang is hardest part of this trip via 5106m high Ganjala pass. The view from the top of pass is Lantang Lirung, Shishapangma (8013m) in Tibet are outstanding. After crossing the Ganjala Pass, we enter to Helambu area, known as ‘Yolmo Heritage’ beautiful villages Malemchi Gaun, Tarke Ghyang, culturally and traditionally magnificent. The locals call themselves Sherpa but the different than Sherpa of Khumbu. The dialects spoken are also different. People here follow the Buddhist religion so we find many old Buddhist monasteries in the villages. 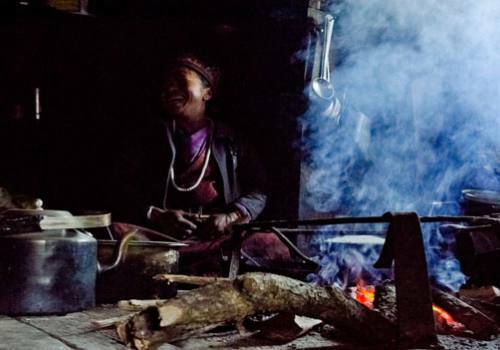 Tarkeghyang is another Sherpa town along the way, which bears its own story. The town name means temple of "100 horses" and was taken from the name of a temple established in 1727 by a Lama (Buddhist monk) who was called on by the king of Kathmandu (Kantipur) to stop an epidemic. As his reward the Lama asked for 100 horses, which he brought here. The local temple, rebuilt in 1969, follows the Bhutanese style. Many great Buddhist masters practiced in the area, including the Tibetan yogi Milarepa , Guru Rinpoche and Yolmopa Terton Ngagchang Sakya Zangpo. Yolmo is famous for innumerable holy and sacred sites. Among the famous caves there are Tag-phug Sen-ge Jong (The Tiger Cave Lion Fortress) just below the village of Tar-kye Gyang, where Milarepa sang his "Song of a Yogi´s Joys", Yang-dag Tsoe-ki Drag-phug (Completely Pure Supreme Cave) which is locally known as "Drub-phug" (Cave of Accomplishment) at an altitude of 14,000 feet, where Guru Rinpoche stayed. Nearby there is a small cave called "Khandro Sang-phug" (The Dakini´s Secret Cave) where his consort Shakya Denma (Shakya Devi) stayed. Another cave of Guru Rinpoche is found in Pema-thang (Tibetan: Zema-Thang= Sandy Flats) a small hidden valley within Yolmo. 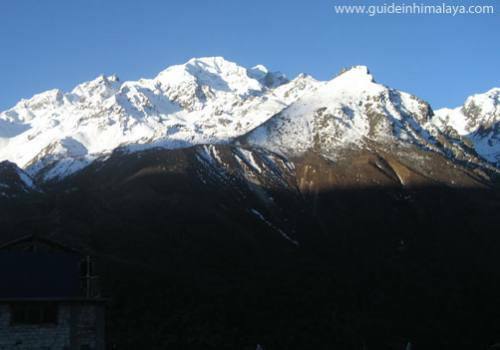 Please kindly read more for Langtang Ganjala Pass Trekking itinerary, Ganjala Pass trek cos. We, GIH arrange experienced Ganjala Pass Trek guide and porter this adventurous trip. Adventurous and personal changing Ganjala Pass that is 5122m high from sea level. 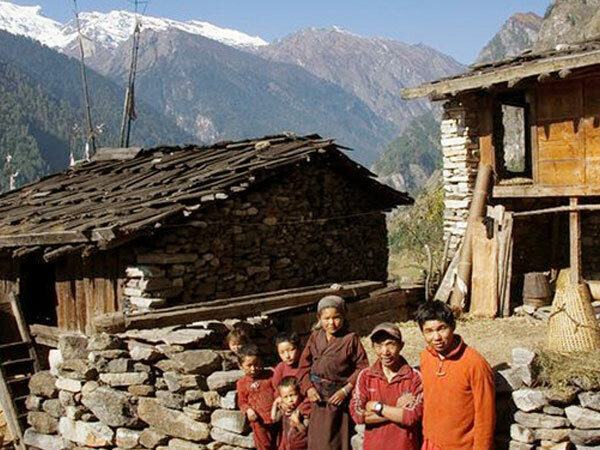 Isolated pristine classic Langtang valley inhabited by warm and welcoming Tamang people. 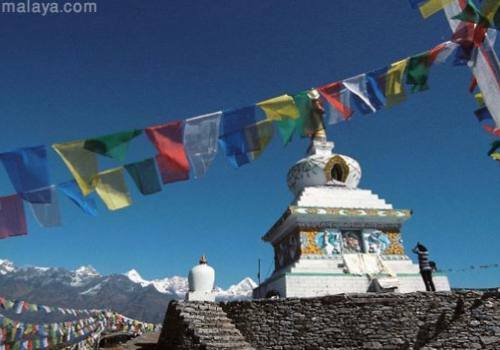 Magically beautiful Himalayan Panorama, ancient old and impressive Buddhist monuments. Wildlife such as Red Panda, Snow leopard, Musk Deer, Black Bear, Tahr, Ghoral and common langur etc. Day 01:Kathmandu - Syabrubensi (1470m). 6-7 hours drive. Stay overnight in Lodge. Drive to Syabrubesi from Kathamdnu. We drive out along the north-western hills of Kathmandu. Enjoy the Himlayan views and mountainous lifestyle through the terraced fields and rustic villages. Take Lunch at the Trishuli Bazar before continuing further to Dhunche. From Dhunche, we descent down to Syabrubesi. Overnight in lodge. Day 02:Trek to Lama hotel (2324m); 5-6 hours of walk. Stay overnight in Lodge. Today; this is our first day of walking day. We will follow the Langtang Khola River going through the dense forests. Cross several suspension bridges. We also pass by a tea houses. The trail goes all the way up but it's not that tough. Day 03:Lama Hotel - Mundu (3500m); 5-6 hours of walk. Stay overnight in Lodge. After having breakfast, we begin our journey towards the village of Mundu. Our trail continues along dense forests. After making a steady climb up through the valley, we leave the tree line behind us. Enjoy the marvelous views of Langtang Lirung. 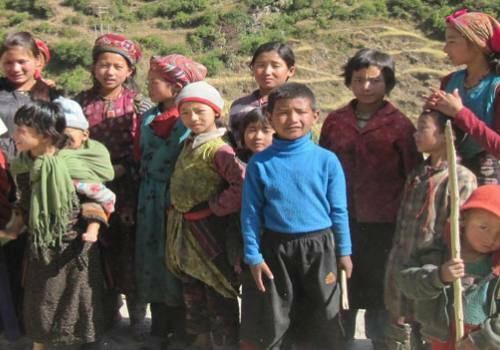 On the way to Mundu, you will also pass the Langtang Village, which was severely affected the the earthquake last year. Langtang Valley alone lost 400 lives, flooded away by an earthquake-triggered avalanche, destroying an entire village and infrastructures. We also see the ruins of Langtang Village, where life is slowing building back and a few tea-houses are reopened. Day 04:Langtang - Kyanjin Gompa (3870m); 3-4 hours of walk. Stay overnight in Lodge. Today; it is short day, we start our day leisurely after breakfast to Kyangjin Gompa, a principal monastery of the region. You will pass by water mills, prayer wheels, chortens, with sacred mounds of rocks with inscriptions carved on them. Also pass the largest mani wall in Nepal, made from stone with prayers written on them. The prayers written on the mani wall is supposed to be blown away by the wind. After the short trek, you will spend the rest of the afternoon exploring the Buddhist shrine and surrounding areas with the amazing views of the mountains. Day 05:Hike to Tserko Ri (4985m) 7-8 hours walk. After taking morning tea and breakfast,we get out of the village and pass on through yak pastures and start for visiting to Tserko Ri (4985) for mountain sunrise views. Since, we are really getting into the high altitudes, you might start feeling the thin air. In the afternoon return to Kanjin Gompa- surrounded by the Himalayas all around. You can take a walk around Kanjin Gompa enjoying the views, glaciers, icefalls, birds and yaks. Overnight in lodge. Day 06:Kyanjing - Ganja La Phedi (4300m): 5-6 hour walk. Taking today's breakfast, we embark on our today's journey to Ganja La Phedi. Cross the Langtang River. Ascend through rhododendron forests. Since, we're already in high altitude, the time for getting to our destination also depends upon the season of the trek. Since, during the winter snow, it might take longer time to cross the snow strewn path. Overnight in tent. Day 07:Phedi - Ganja La pass(5122m) - Keldang (4250m): 7-8 hour walk. Today we cross the Ganja La pass (5122m). It'd be a strenuous day since Ganja La is one of the difficult passes. 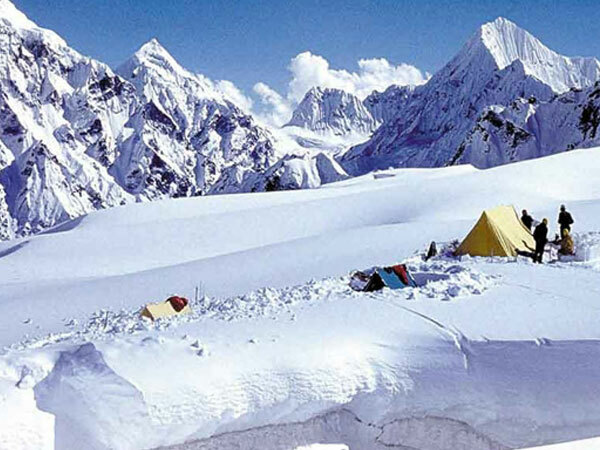 Ganja la pass is covered with snow almost throughout the year. Make the long ascent through the boulders, pass the small lakes, and summit the Ganja La which situated on a rocky moraine. Enjoy the spectacular views from the pass. Climbing up and down the pass can sometimes be tricky due to snowfall and ice. From the pass, we descend down to Keldang. Today we cross the Ganja La pass. It'd be a strenuous day since Ganja La is one of the difficult passes. Ganja la pass is covered with snow almost throughout the year. Make the long ascent through the boulders, pass the small lakes, and summit the Ganja La which situated on a rocky moraine. Enjoy the spectacular views from the pass. Climbing up and down the pass can sometimes be tricky due to snowfall and ice. From the pass, we descend down to Keldang. Overnight in tent. Day 08:Keldang – Dukpu (4080m); 6-7 hours of walk. Trek from Keldang to Yak Kharka. From Keldang, we descend further down following a prominent ridge line. In our 5-6 hrs trek today, we continue losing our altitude through forests, ridges, and grasslands. Overnight in tent. Day 09:Dukpu – Tarkeygyang (2600m); 6-7 hours of walk. Stay overnight in Lodge. 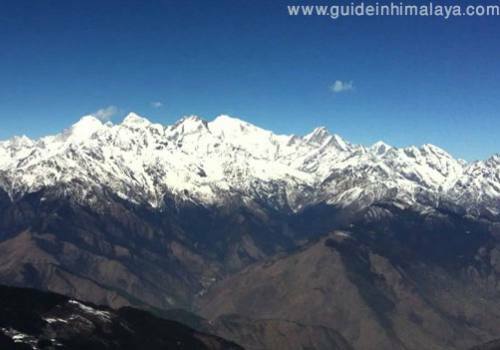 Day 10:Explore Local culture and day hike to Malamchi Gaun. Overnight in lodge. Day 11:Tarkeygyang – Thimbu (1580m); 3-4 hours of walk. Stay overnight in Lodge. Day 12:Thimbu – Drive to Kathmandu. Stay overnight in Hotel. An experienced registered English speaking friendly adventure guide. Assistant guide to look after the group and team as per group size. Porters to carry your main pack and camping gear. All ground transportation to and from Ganjala Pass trekking. All camping gear: Tends, sleeping mattress and kitchen utensils. 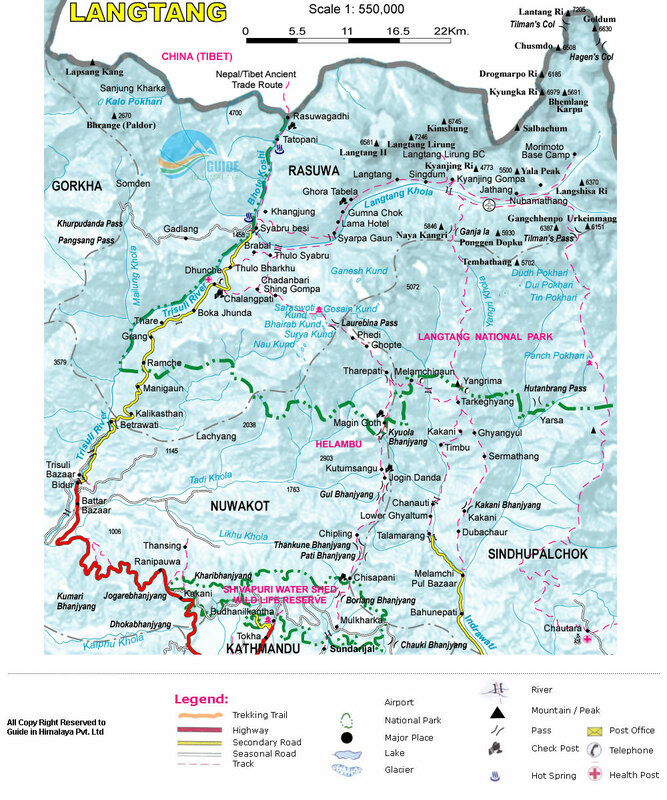 All necessary trekking permits for Ganjala Pass Trek in Langtang. Government local taxes and company service charge. Transportation, accommodation and meals in Kathmandu. Toiletries, internet, phone calls and personal nature expenses. 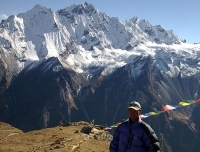 Guide in Himalaya is a group of local trekking guides affiliated with Wilderness Excursion is a local certified trekking agency so we guaranty small private group departures any dates that suits your date and time. International tour leader are highly encouraged to get special discount and complementary.